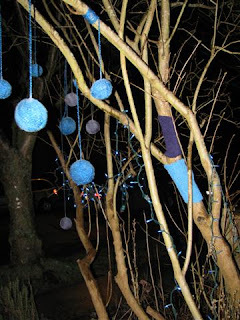 I yarn bombed our front yard last year. I think of it more as a balm than a bomb. Wikipedia says: "Graffiti knitting, yarnbombing or yarn bombing or yarnstorming is a type of graffiti or street art that employs colorful displays of knitted or crocheted cloth rather than paint or chalk. While yarn installations may last for years, they are considered non permanent, and, unlike graffiti, can be easily removed if necessary. While other forms of graffiti may be expressive, decorative, territorial, socio-political commentary, advertising or vandalism, yarn bombing is almost exclusively about reclaiming and personalizing sterile or cold public places". Plants can be soooo competitive.